Over the weekend Fleet Street Blues has had a bee in its bonnet about the “pretence” of data journalism and Saturday’s Guardian front page: “Half UK’s young black men out of work“. This, says FSB, is a lie that demonstrates the “pretence” that “‘crunching the numbers’ is somehow an an abstract, scientific, mathematical task”. There are two problems with this: the first is that I’ve never heard a data journalist make this claim; and the second is that the ‘lie’ does not come from a data journalist (they generally don’t write headlines). It is, in short, a straw man. The story itself is, however, perfectly valid. While FSB points to the exclusion of students, for example, The Guardian’s story mentions that early on. “Youth unemployment figures are always slightly odd, and as with many things in life, it’s students that get the blame. Fleet Street Blues uses the raw data published by the Datablog to highlight a number of other ways of interpreting the data, all of which are interesting – and in fact, I’ll probably use them in future as an example of how the same data can tell many different stories. But again, this proves nothing about the ‘pretence’ of data journalism. All it proves is that there is more than one story to be found in a dataset, and that journalists will pick the one that is most newsworthy for their particular market. In fact, not only journalists, but politicians, PR staff, marketers, scientists, lobbyists and anyone else who wants to tell a story. It’s because of this that data journalism is not something which should be snootily written off as a “fad”. Data is important. Journalists need to be able to interrogate it and find the stories that are not being told. That is exactly what The Guardian have done. Yes, the headline could be more accurate* – but how many times has a headline writer omitted key details due to the limitations of space (on every type of story)? And yes, as one FSB commenter points out, the inclusion of whole numbers would have added further context. But the irony is that it’s precisely because The Guardian isn’t trying to pretend to be ‘The Only Truth’ that FSB and its commenter can interrogate the data, and that the reader can understand the subtleties in how data is gathered and classified. The more good data journalism we have, the less that anyone – including journalists – can pretend to the idea of a “scientific” process. This entry was posted in data journalism, regulation and tagged accuracy, datablog, Fleet Street Blues, Guardian, James Ball, unemployment on March 12, 2012 by Paul Bradshaw. 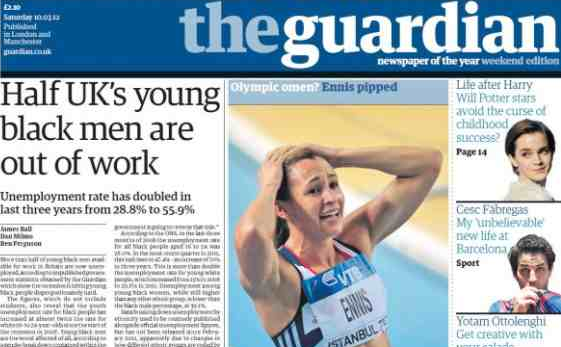 The problem is that the Guardian knew its headline was wrong (not just misleading) and still published. This must discredit the newspaper’s reputation for accuracy, if not data journalism more widely. Although it would still be misleading, if the headline was “Black youth unemployment rate is over 50%” it would have least have not been wrong. The newspaper headline is one which is read by people who don’t read the story, so I think it has a special responsibility to be accurate. Yes, the headline is misleading, and that does reflect badly on The Guardian. However, given that the practice of ‘simplifying’ things into as few words as possible for headlines is widespread, I’m not sure how much The Guardian realistically suffers. Also, I’d love to see some research into how much credibility people put by headlines – we seem to underestimate the media literacy of readers a lot. In the place of the person who had to write that headline, I’m not sure I would have done a better job. Perhaps there’s a case here for better ‘data subbing’ – how well are subs trained to write accurately on data stories? A senior Guardian journalist in the comments said they all ‘agonisef’ over it, so we can’t blame the subs.